A month ago I posted a photo of a little Swamp Wallaby with a badly-wounded 'elbow' outside the office. The next time we saw him he was looking very sick and the wound had swelled up, but a few days later there he was again, swelling had gone down and he was looking much better. Today on their walk our guests found him in a very, very bad way and close to the end so very sadly we put him out of his obvious agony. 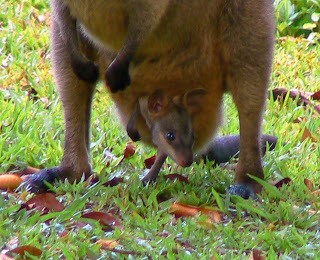 On a happier note his 'missus' and her fast-growing joey are now regular visitors to the bungalows much to the joy of everyone, especially the folks from overseas. This is not our 'current' family but one I snapped a while ago.